"The Lachmund Family House is a two-story, cream brick house with an irregular footprint, wrap-around front porch and complex roof shape. 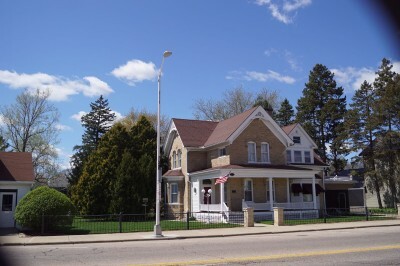 It is notable for its location, being the only residence of its size and type in the business district of the village of Sauk City, Wisconsin. The setting of the house is highlighted by a wrought iron fence which is a restoration of an historic feature, and a spacious lawn. The house is significant for its association with four generations of the Lachmund family, who were among the leading citizens of the village in its formative years and up to World War II. Paul Lachmund inherited it from his mother, Bertha Lachmund Halasz, in 1877. He was an important figure in the development of the village and also in the organization of the retail lumber business in the Midwest. The location and size of the house recall the social and economic importance of the Lachmund family in the formative years and during the most prosperous period of the village history. The house displays characteristics of the Gothic and Queen Anne styles executed with exceptional materials, design and workmanship. "The house faces east at a bend in Water Street. Across the street is a one-story brick building, formerly a bank and now the village hall. Behind it is the Wisconsin River. Commercial buildings of various sizes and in a pastiche of styles line both sides of Water Street to the south and for the remainder of the block to the north. The Lachmund Lumber company, which was founded in 1846 by Charles Halasz and was continued by the Lachmunds until 1968, was located a few yards north of the house, on the same side of Water Street. It is now the site of a new bank building in an aggressively historical "classical" style. Between the house and the site of the lumber yard is a wood frame two-story building that was the home and store of the town photographer. In 1890 it became the furniture store and undertaking business of William Dresen, a carpenter who "literally built Sauk City" according to the description in Lives Lived Here. [Editor's Note: Lives Lived Here: A Walk Through the History of Sauk City by Myrtle Cushing and Michael J. Goc, New Past Press, Friendship, Wisconsin, 1992.] Immediately to the south of the Lachmund house is a small frame building occupied by the Sank Prairie Eagle. August Derleth identifies it as the Fuchs home. South of that is the harness shop of William Schwenker, immortalized by August Derleth as the home of his companion, Sim. The real Sim, Hugo Schwenker, still lives on the second floor of this frame building, which was built in 1866 to house a saloon and the saloon keeper's family, according to Lives Lived Here." Description condensed from National Register of Historic Places Registration Form prepared for the National Park Service. The application, dated September 15, 1998, was prepared by Jane Eiseley, historic preservation consultant. For more about this site, follow the link below to find the document quoted above.